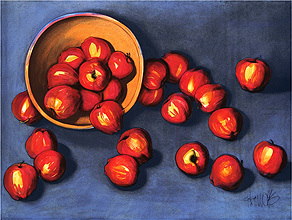 this representational, still life, watercolor and charcoal drawing by patricia hendricks features a contemporary cornucopia of apples, rendered in american reds and blues. signed, Giclee Print from a watercolor and charcoal drawing. printed on archival media. Limited editions of 150 available in two sizes on canvas. A of authenticity is included with each print. For canvas prints, image size equals stretcher bar size. Try this art in your space and show it to your friends with our custom Art Fittings.